proprietà disponibile per il vostro uso. La piscina non è attualmente riscaldata. assistenza necessaria per rendere piacevole la tua vacanza! Tutte le lenzuola, bicchieri, argenteria, pentole e padelle sono forniti pure come una caffettiera e forno a microonde. C'è anche una lavastoviglie, ferro e asse da stiro, lavatrice e asciugatrice. Il servizio via cavo è previsto per la visione televisiva e il wi-fi è incluso nel noleggio. We were extremely impressed with the accommodations. Everything we needed to cook, clean, etc was there for our use! The bed was very comfortable, which is important to my husband and I. The neighborhood is friendly and very helpful. Thank you very much for thinking of even the smallest things to make our stay enjoyable. - Kim S.
I wish we had had a chance to meet you! And we are so happy that you enjoyed our condo. Please keep in touch, as we'd love to have you return. We enjoy staying at this location . Very quiet complex with nice clean swimming pool and public areas well looked after. People who live there are very friendly. Clean, well equipped, great location, nice floor plan. It was a great place to get together with our fairly large family for Thanksgiving and during the week of our visit. The location was perfect and enough out of the way to enjoy some peace and quiet. It was well equipped, the beds were comfortable, and we felt very at home. We would definitely stay here again. Very nice condo and well appointed. Plenty of room. Everything one needs in a home away from home. The hosts were so accommodating and gracious. 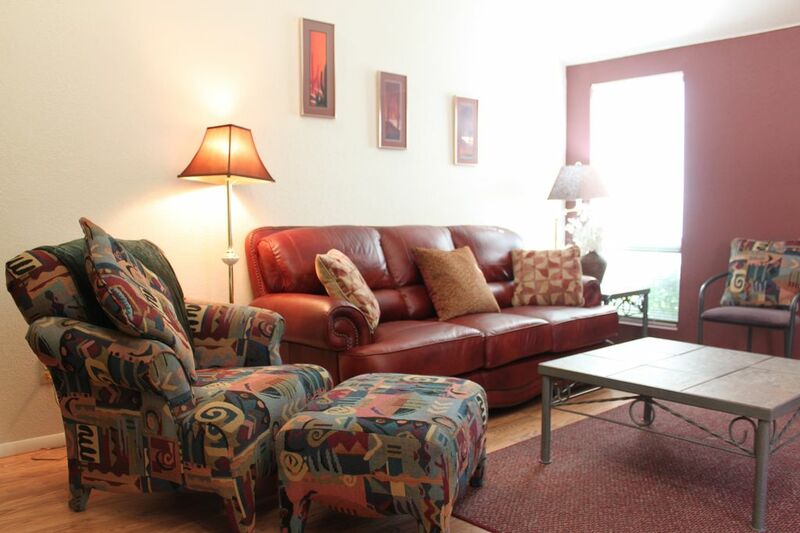 The location was great; close to shopping center, theaters, entertainment, hiking and biking. I would definitely stay here again. Thank you, J.C. and Carleen. The unit we stayed in was bright and comfortable and had everything we needed. More than enough room for the two of us with two full baths and two spacious bedrooms. The place is exactly as photos show. Furniture is perhaps a little dated but comfortable and clean. There is a small very private patio with a table, umbrella and chairs We used the patio a lot just to sit out and read as it was not really hot enough to hang out by the pool. The complex itself is very quiet and well looked after. We were there for 11 days and every day there were people working around the grounds, cutting grass, weeding etc. It's an older quite extensive condo complex and for the most part is kept up well. The one area we felt could be improved upon was the pool area. Nice enough layout and appeared to be clean but just starting to look a little shabby and definitely in need of new and more poolside chairs. The owners of our unit were very pleasant and friendly. We were fortunate to meet them while there and they immediately asked how everything was and if there was anything we needed. Overall a great place and we would definitely stay there again! We stayed in unit 25 for a week with our two children! Had sooo much fun, we extended it one day. The pool is so refreshing and the hot tubs were so relaxing. The king bed upstairs is just tremendously comfortable. Our thirteen year old enjoyed the downstairs bedroom and all the extra ammenities: bathroom to himself (with a jacuzzi style tub), cable television, lots of storage and a door to the outside patio. Our three year old and us enjoyed the upstairs spacious loft bedroom with a king bed, walk in closet and walk in shower. Everything was so comfortable and relaxing. Conveniently located off of Tanque Verde, love this side of town. We cannot say enough about the facilities and the owners are so helpful with true down-home hospitality! The unit was clean and refreshing and we loved the idea of cleaning when we left to avoid the cleaning fee. I would completely recommend this property to anyone. The only negative thing I would note is that our vacation HAD to end and we HAD to leave our Home away from Home.